The Tech Detectives use Zello to communicate with each other. Editor's Note: Two Black River Middle School teachers, Laura Garrison and Kathy Vespignani, contributed to this post. Laura teaches 6-8th grade technology, and Kathy teaches 6-8th grade performing arts. Picture it: a middle school in Anytown, U.S.A. has a teacher that is struggling to figure out why her SmartBoard is acting up. Typically she would submit a "tech request" and wait an extended period of time for it to be fixed. One issue, though -- she needs the device now for a very important math lesson. She suddenly remembers that a group of students called the "Tech Detectives" can come to the rescue and fix the problem. Within minutes, several students arrive, play around with a few wires and buttons, and the malfunction is addressed in no time. 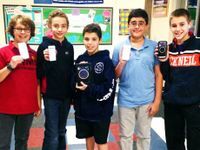 The Tech Detectives Club was created at Black River Middle School in Chester, New Jersey as a way for students to take ownership of the technology they utilize during their various learning experiences. Based on feedback from various school stakeholders who have a passion for technology, it was deemed necessary to start a club that arms students with a strong technological skill set. On a regular basis, students create tutorials, assist teachers, learn about technology trends, collaboratively problem solve issues, and gain exposure to career readiness. The excitement generated from this program is truly remarkable. Below, you will find guidance on how to start your very own Tech Detectives Club. There is no doubt that the first thing needed to make this sort of program happen is unwavering support from school stakeholders. Administration and the board of education must provide the resources necessary to ensure that students are provided with a sound educational experience. Teachers must be willing to tap into students' knowledge of technology and, when called upon, supervise students after school. Parents are needed to encourage active involvement, provide transportation after school, and secure monies at the PTO (Parent Teachers Organization) level. Community members must be willing to visit school, provide real-world knowledge, and show students what it takes to be successful in the world of technology. Finally, students must be willing to take on the challenge of being part of a team that contributes to improving school culture and ensuring technology issues are addressed. Advisors send out an email to the staff to find out if a laptop cart needs cleaning up. Sometimes students themselves see the need during class, and they ask the teacher directly if they could benefit from the services of the student techs. Each student that walks through the door has something to bring to the group. Cultivating a spirit of sharing and collaboration is paramount to success within the group. During one club meeting, the students and advisor(s) may be headed in three different directions: one group off to service a laptop cart, one group to check out a glitchy interactive whiteboard, another group to create a “how-to” video in the library. The students have skills to share, and there are members of the community that would love to learn. Members of a local senior citizens' group, the "50+ Club," are eager receivers of the information. Sensitivity training lessons are a topic of discussion before students are sent to help. Students of the tech clubs very often have parents that are professionals in a high-tech field. Having them share their experience can validate the students' involvement in the club. Overall, the club is a win-win for all who are involved. The students have a confidence boost, the teachers receive needed help, community members and parents build partnerships with students, and administration can see how their unwavering support can help redefine student success. Does your school have Tech Detectives or a similar club? What's your experience with providing this kind of opportunity to young people?